Beyond energy-efficiency or green technology, what if buildings could actually mitigate urban pollution problems? Well, architects Allison Dring and Daniel Schwaag of Berlin-based Elegant Embellishments are attempting to do just that. They developed a tile with the catchy name of proSolve370e. This tile, based on its shape and chemical coating, is designed to eliminate urban pollutants associated with city smog. 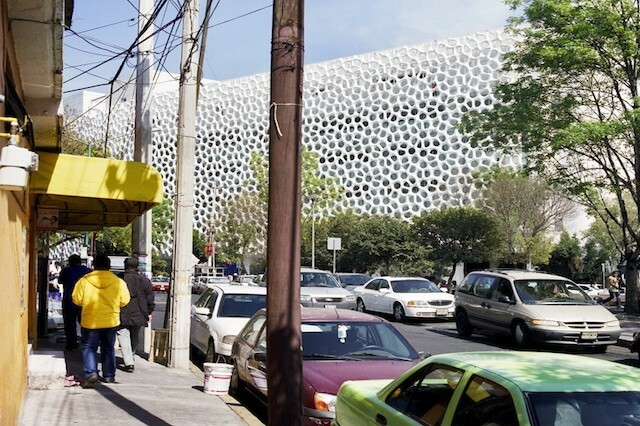 It is currently being incorporated within the building façade of a new hospital,Torre de Especialidades, under construction in Mexico City – a city notorious with its urban pollution problems. While the idea is still in a pilot/ test phase, it demonstrates the proactive approach that many urbanists and architects are now taking: not just zero-energy buildings, but buildings that produce energy; not just pollution-neutral buildings and urban spaces, but pollution-eating buildings or urban spaces. Apparently Chicago is also into the trend, lining its streets with pollution-consuming pavement. Sounds like a great idea! After all, there are some dirty cities out there! But not for much longer… breathe in deeply, it’s safer now! Want to know more, check out the expanded article on Take Part. Previous Post Stuttgart: taking your bike on the tram? No problem!